Are you frantically composing your allergy-friendly Thanksgiving menu? 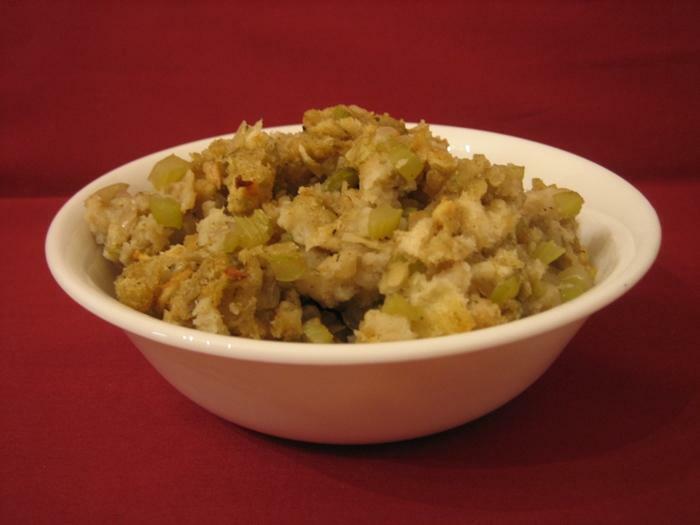 We're here to help and today we offer two stuffing recipes. Both recipes are made without milk, eggs, nuts, fish, shellfish and can be made soy-free and wheat-free/gluten-free as well. Toast bread two times, and chop into small pieces. In large bowl, mix all ingredients together and stuff in turkey. This makes enough to stuff a small turkey. Use dairy, soy, egg, corn, wheat and/or gluten free ingredients as needed. Egg replacer must be omitted to make corn free. In a large saucepan, saute celery (and onions, if using) in margarine or oil over low flame until tender. Add seasonings and saute until fragrant. Add bread to saucepan and mix well. In a separate bowl, prepare egg equivalent, then add milk and broth or water to bowl. Add to bread mixture, and mix well (you may need to add slightly more liquid of your choice). Cook mixture over a low flame for about ten minutes, taking care to not let it get too dry. If you are omitting onions, you may opt to add 1/4 to 1/2 cups additional chopped celery in order to replicate the onion "texture". In a pinch, you can omit the milk subs and boost the broth to 1 cup, then add 1/4 to 1/2 cup additional water. This recipe works with gluten free breads - specifically, it has been tried w/ EnerG Rice and EnerG Light Tapioca breads. Use milk, soy and corn-free margarine, oil, broth, and bread as needed. 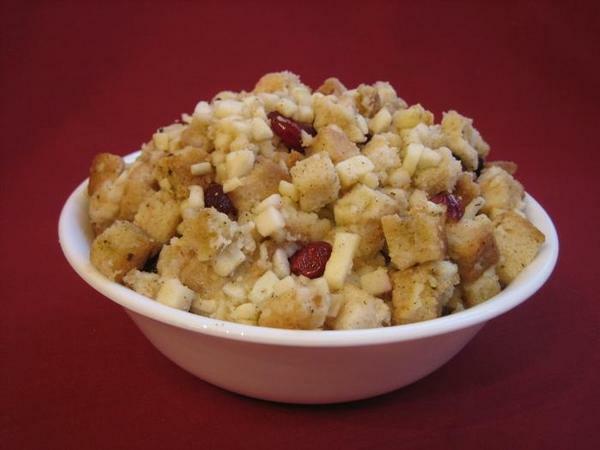 I use Kathy P’s Croutons recipe for the bread crumbs, and Lynda’s Chicken Broth recipe for the broth. This recipe was modified from a very old recipe that my Grandma used to make. My family has modified it to make it safe for my kids, and it tastes exactly the same! After preparing it on the stovetop, I sometimes bake the mixture in a 350° F oven to make it crispy. If you stuff your turkey, double this recipe for a 10 lb turkey. These recipes were submitted to the Kids With Food Allergies Foundation collection of allergy-friendly recipes called, Safe Eats. The photos are courtesy of Kristin Johnston. 1) These recipes have been donated by our members and have not been tested in a test kitchen, therefore we can't guarantee the results. 2) Safety of ingredients is important. As we all know the same product manufactured in different plants at different parts of the country may not contain the same ingredients. 3) For the "free of" categorization, you should not make any assumptions as to the safety of an ingredient that is included in any of these recipes. It will be up to you to do your own research to make sure that each ingredient in these recipes is indeed safe for your child's unique allergy issues. If you need help with finding safe substitutions, feel free to post a question on our Food & Cooking Forum. I updated the error on the photos so they should be visible to all, now. Danielle, you're welcome---we hope you like the recipes!